In an effort to better organize my home workspace I decided that I needed to get some of my non-work tools out of boxes/bags and into places where I could more easily access the ones I use most. My solution was simple, and probably the same solution that many of you use, pegboard. 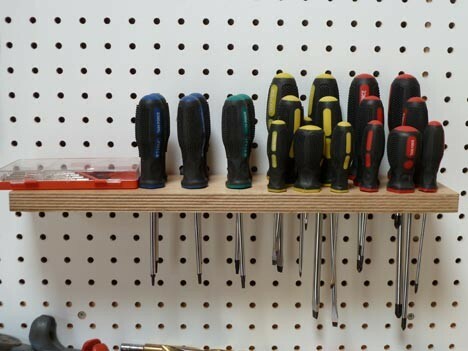 A full sheet of pegboard is cheap, and with the right hooks and attachments, you can organize a good portion of your tools. Next all I needed was pegboard hooks. Lucky for me, my Father had a box full of them that he let me dig through. Most of the hooks he had came from old retail store displays, so my selection was pretty much limited to straight hooks. Not a problem though; I always turn to Harbor Freight for things like this, and sure enough, online they show a full selection of peg board hooks. One of the tools I use the most are screwdrivers, so putting the screwdrivers front and center made the most sense. I didn't have a pegboard holder for screwdrivers so I was just going to pick some up at HF, but then I thought, why don't I just make my own? I have screwdrivers of all different sizes, and I didn't know how well the smaller ones would work in the store bought holder, plus all of those screw drivers would take up a lot of space. I had some small pieces of Baltic Birch plywood that I could use, and it would match the cabinets I built. 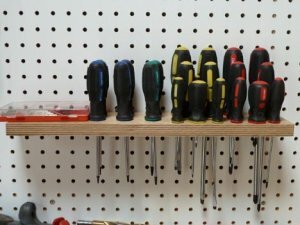 My idea was to drill holes in the plywood for the screwdrivers, and then attach it to the pegboard with two hooks. The first step was to mark where I would have to drill holes for the peg board hooks. I had some hooks that were shaped like a u-turn, so by cutting these in half and to length, I would have a single hook for each side. Next I grabbed a pencil and a tape measure to layout holes for each screwdriver. I found that I could get three rows of drivers in, with the largest in the back. After drilling out holes for all of the screwdrivers, I drilled into the side of the plywood for the hook holes, and also made a notch in the ply to allow it to sit flush to the pegboard. As you can see, I left the plywood a little long on one end to hold the case of micro drivers. I am happy with the way the holder turned out. I saved a few dollars by building it myself, and came up with a solution that I think works better then having multiple hooks do the job that my single hook can do. I can see this same method being used for other tools as well, or simply as a shelf.